Connie is determined to put things right when her past catches up with her. John's visit to an RAF base helps with his memory loss. 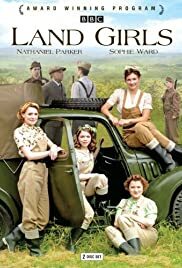 I am a huge fan of British drama, especially WWII homefront stuff, which Land Girls is. I stuck it out only because of this and the lovely English village and countryside locations. It reminded me of series like Heartbeat, which have some heart-stirring bits mixed in with the silliness. Here, Mark Benton plays the Mr. Greenglass part of the "comic relief", only it's not so comic and nowhere near relief. What kept coming to mind while I watched this whole series was "stupid people making stupid decisions and doing stupid things". If someone could mess up or make the wrong choice or do the dumbest thing possible, they would. Sometimes to "advance" the plot but sometimes just because they were annoyingly dumb. Some stuff was just ridiculous for the sake of being ridiculous. Or maybe the show runners thought it was funny, but it could only be interpreted as humorous if you like very juvenile, slapstick silliness. And I realise that some people do. I'm not going to get specific to illustrate my point because 1. spoiler alert would be necessary, and 2. I just can't even remember much of what I found so objectionable because it's just not important to me. What I DO recall is how annoyingly stupid so much of it was. And I'm not basing that on 20 minutes into the first episode and then giving up in disgust. I actually watched the entire 15 episodes and it was all cut from the same silly cloth. Scenery was wonderful; acting was generally convincing; scripts generally dreadful.